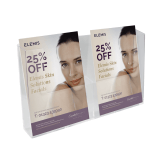 Display leaflets anywhere in your business with this pre-drilled wall mounted dispenser designed for holding A5 landscape literature. 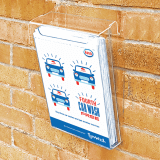 Ideal for doctors, banks, solicitors, universities, tourist centres and many more places, this leaflet holder is a great investment. This unit has been manufactured in clear Supervue styrene.